Last week I reduced my hours at Sparkbox down to 20 hours/week, so I could have more time to work on Gridmaster. I haven’t talked much about Gridmaster on the blog, but it’s an idea I’ve been playing with for a while now. 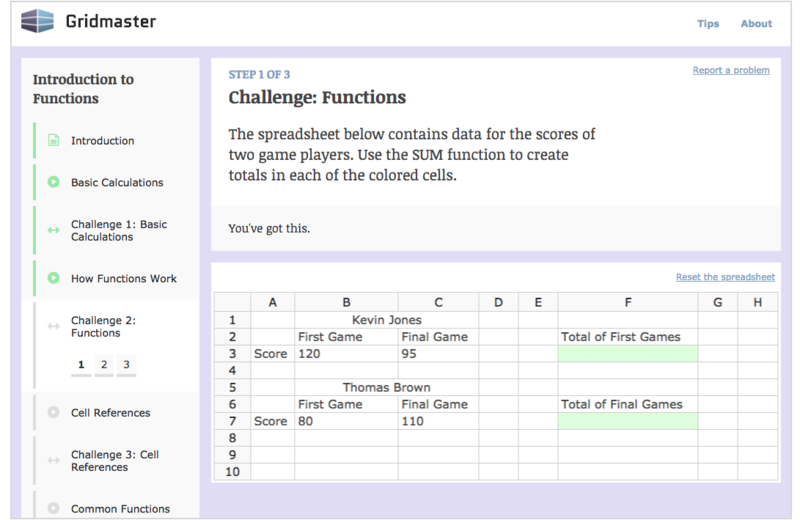 I wanted to see if it was possible to learn spreadsheet skills in a more interactive way than reading a book or watching a video. I was inspired by online learn-to-code courses (like the ones offered by Codecademy and Code School) and I wondered if I could apply the learning approach to other skills. Plus, it would be a fun way to mix two of my interests (web programming and education). It worked, but only kind-of. The in-browser spreadsheet wasn’t as mature as programs like Microsoft Excel and thus it was missing several things like robust keyboard navigation, shortcuts, and advanced spreadsheet functions. Still, the demo got upvoted on Hackernews and I got a bunch of positive feedback. I considered it enough validation to keep going. Now I’ve got five interactive courses and anyone can install the addin and start learning today. I’m proud of where it is, but there’s a lot more I want to do and it’s been hard to make significant progress on nights and weekends. Right now, I feel like I just need more time, and reducing my hours at Sparkbox gives me that time. Now that I have an extra 20 hours each week, I’m planning to spend 75% of that time on marketing and the other 25% on developing the product. There’s a lot I don’t know so I’m looking forward to all of the new opportunities to learn. If you’re still reading this, then you certainly have enough curiosity to download the addin and just see what it’s like. 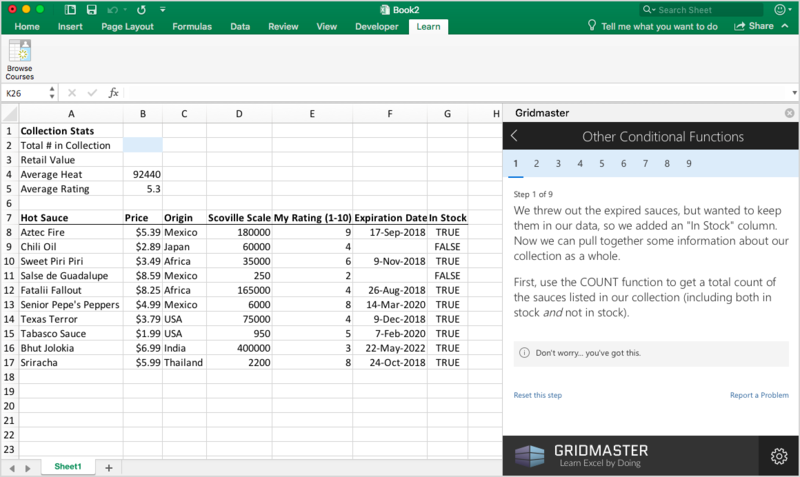 It’s free, and if you don’t have Excel on your computer you can use Excel online (also free). Just do it!